Diagrams of some typical phytoplankton. Phytoplankton are the autotrophic component of the plankton community. As plankton, they are organisms (mostly microscopic) that drift in the oceans, lakes, rivers, and other bodies of water. As autotrophs, they are the producers in a food chain, producing complex, energy-rich organic compounds, such as carbohydrates, from simple inorganic molecules using energy from light (photoautotrophs), or, less commonly, energy from inorganic chemical reactions (chemoautotrophs). Most phytoplankton are too small to be individually seen with the unaided eye. However, when present in high enough numbers, they may appear as a green discoloration of the water due to the presence of chlorophyll within their cells (although the actual color may vary with the species of phytoplankton present due to varying levels of chlorophyll or the presence of accessory pigments such as phycobiliproteins, xanthophylls, etc.). Phytoplankton provide an essential ecological function for all aquatic life by serving as the base of the aquatic food web. They also provide a function for almost all life on earth, as it is phytoplankton that are responsible for much of the oxygen present in the Earth's atmosphere. Phytoplankton also serve as a key food item in both aquaculture and mariculture. 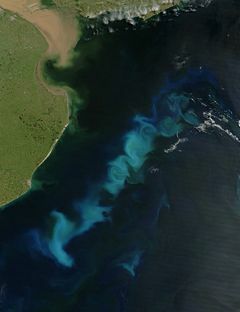 Phytoplankton bloom in the South Atlantic (February 15, 2006) seen from space. The name phytoplankton comes from the Greek words phyton, meaning "plant," and planktos (πλαγκτος), meaning "wanderer" or "drifter" (Thurman 1997). These organisms are carried along by the water current, in contrast to nekton organisms that can swim against the current and control their position, and in contrast to benthic organisms that live on the bottom of bodies of water. Phytoplankton are autotrophs in that they are able to take energy from the environment in the form of sunlight or inorganic chemicals and use it to create energy-rich molecules such as carbohydrates. This mechanism is called primary production. It is in contrast to heterotrophs, which take in autotrophs as food to carry out functions necessary for their life. Thus, heterotrophs depend on autotrophs for the energy and raw materials they need. Phytoplankton most commonly obtain energy through the biological process called photosynthesis. They therefore must live in the well-lit surface layer (termed the euphotic zone) of an ocean, sea, lake, or other body of water. Through photosynthesis, phytoplankton are responsible for much of the oxygen present in the Earth's atmosphere—half of the total amount produced by all plant life (EO 2005). In addition to these photoautotrophs, which carry out photosynthesis to acquire energy (using sunlight, carbon dioxide, and water), there are also chemoautotrophs. Chemoautotrophs do not use solar energy as their energy source, but rather energy by the oxidation of electron-donating molecules in their environment. They do synthesize all necessary organic compounds from carbon dioxide, rather than organic sources of carbon. Examples include bacteria that derive energy from oxidizing inorganic compounds such as hydrogen sulfide, ammonium and ferrous iron. Organisms that require organic compounds as a source of carbon, even if they use light or inorganic compounds as a source of energy, are not defined as autotrophic, but rather as heterotrophic. In addition to sunlight (or inorganic energy sources in the case of chemoautotrophs) and inorganic carbon sources, phytoplankton are also crucially dependent on minerals. These are primarily macronutrients such as nitrate, phosphate, or silicic acid, whose availability is governed by the balance between the so-called biological pump and upwelling of deep, nutrient-rich waters. However, across large regions of the World Ocean such as the Southern Ocean, phytoplankton are also limited by the lack of the micronutrient iron. This has led to some scientists advocating iron fertilization as a means to counteract the accumulation of human-produced carbon dioxide (CO2) in the atmosphere (Richtel 2007). Large-scale experiments have added iron (usually as salts such as iron sulphate) to the oceans to promote phytoplankton growth and draw atmospheric CO2 into the ocean. However, controversy about manipulating the ecosystem and the efficacy of iron fertilization has slowed such experiments (Monastersky 1995). Phytoplankton's cumulative energy fixation in carbon compounds (primary production) is the basis for the vast majority of oceanic and also many freshwater food webs. As a side note, one of the more remarkable food chains in the ocean—remarkable because of the small number of links—is that of phytoplankton fed on by krill (a type of shrimp) fed on by baleen whales. The term phytoplankton includes all planktonic, photoautotrophic microorganisms in aquatic food webs. However, unlike terrestrial communities, where most autotrophs are plants, phytoplankton are a diverse group, incorporating protistan eukaryotes and both eubacterial and archaebacterial prokaryotes. While almost all phytoplankton species are obligate photoautotrophs, both photoautotrophs and chemoautotrophs are included in the phytoplankton. Overall, there are about 5,000 described species of marine phytoplankton (Hallegreff 2003). There is uncertainty in how such diversity has arisen in an environment where competition for only a few resources would suggest limited potential for niche differentiation (Hutchinson 1961). In addition, the plankton in general includes zooplankton (heterotrophic, sometimes detritivorous, type of plankton). There also are organisms that are called mixotrophic because they obtain their electrons from an inorganic electron source, such as hydrogen-sulfide, ammonium, and hydrogen, while using organic matter as a carbon source. These later are sometimes labeled as phytoplankton although they technically are heterotrophs, since their carbon source is not inorganic but organic. An organism that obtains carbon from organic compounds but obtains energy from light is called a photoheterotroph, while an organism that obtains carbon from organic compounds but obtains energy from the oxidation of inorganic compounds is termed a chemoheterotroph. Among non-pigmented species that are sometimes known as phytoplankton, but actually are heterotrophic and generally viewed as zooplankton, are dinoflagellate genera such as Noctiluca and Dinophysis; that obtain organic carbon by ingesting other organisms or detrital material. In terms of numbers, the most important groups of phytoplankton include the diatoms, cyanobacteria, and dinoflagellates, although many other groups of algae are represented. One group, the coccolithophorids, is responsible (in part) for the release of significant amounts of dimethyl sulfide (DMS) into the atmosphere. DMS is converted to sulfate and these sulfate molecules act as cloud condensation nuclei, increasing general cloud cover. In oligotrophic oceanic regions such as the Sargasso Sea or the South Pacific gyre, phytoplankton is dominated by the small sized cells, called picoplankton, mostly composed of cyanobacteria (Prochlorococcus, Synechococcus) and picoeucaryotes such as Micromonas. Diatoms. Diatoms are one of the most common types of phytoplankton and are found in large numbers in almost all waters of the world, freshwater and saline (as well as in moist soil and other environments). Diatoms are unicellular or (less commonly) colonial algae characterized by unique cell walls of silica. In favorable conditions, these protists "bloom," reproducing rapidly so that they dominate an area. When conditions turn less favorable, for instance the coming of winter or a depletion of nutrients, they can turn dormant and sink to lower levels until currents return them to the surface and a new bloom can take place. Dinoflagellates. Dinoflagellates are also protists, but differ from diatoms in having a whip-like tail (flagellum) that enables them to move in the water, mostly up and down in response to changing conditions. They typically are characterized by being single-celled and with two dissimilar flagella during at least part of their life cycle. Among the dinoflagellates are both species exhibiting the characteristics of plants and those exhibiting characteristics of animals, with about half of them being photosynthetic autotrophs, while the balance are heterotrophs securing nutrients by acting as predators, endosymbionts, or parasites. Most dinoflagellates are marine plankton, but they are common in fresh water habitats as well. Dinoflagellates also bloom, which can create a "red tide" in which they release toxins that can kill fish and/or humans who eat shellfish in which the toxins have become concentrated. Those dinoflagellates that do not use photosynthesis but eat other organisms are considered zooplankton. Phytoplankton are a key food item in both aquaculture and mariculture. Both utilize phytoplankton for the feeding of the animals being farmed. In mariculture, the phytoplankton is naturally occurring and is introduced into enclosures with the normal circulation of seawater. In aquaculture, phytoplankton must be obtained and introduced directly. The plankton can either be collected from a body of water or cultured, though the former method is seldom used. Phytoplankton is used as a foodstock for the production of rotifers (McVey et al. 1993), which are in turn used to feed other organisms. Phytoplankton is also used in many varieties of aquacultured mollusks, including pearl oysters and giant clams. The production of phytoplankton under artificial conditions is itself a form of aquaculture. Phytoplankton is cultured for a variety of purposes, including as foodstock for other aquacultured organisms, a nutritional supplement for captive invertebrates in aquaria, and as a source of bio-diesel. Culture sizes range from small-scale laboratory cultures of less than one liter to several tens of thousands of liters for commercial aquaculture (McVey et al. 1993). Regardless of the size of the culture, certain conditions must be provided for efficient growth of plankton. The majority of cultured plankton is marine, and seawater of a specific gravity of 1.010 to 1.026 may be used as a culture medium. This water must be sterilized, usually by either high temperatures in an autoclave or by exposure to ultraviolet radiation, to prevent biological contamination of the culture. Various fertilizers are added to the culture medium to facilitate the growth of plankton. A culture must be aerated or agitated in some way to keep plankton suspended, as well as to provide dissolved carbon dioxide for photosynthesis. In addition to constant aeration, most cultures are manually mixed or stirred on a regular basis. Light must be provided for the growth of phytoplankton. The color temperature of illumination should be approximately 6,500 K, but values from 4,000 K to upwards of 20,000 K have been used successfully. The duration of light exposure should be approximately 16 hours daily; this is the most efficient artificial day length (McVey et al. 1993). Earth Observatory (EO). 2005. Satellite sees ocean plants increase, coasts greening NASA. Retrieved February 15, 2009. Hallegraeff, G.M. 2003. Harmful algal blooms: A global overview. In G. M. Hallegraeff, D. M. Anderson, and A. D. Cembella, eds., Manual on Harmful Marine Microalgae. Paris: UNESCO. ISBN 9231038710. Hutchinson, G.E. 1961. The paradox of the plankton Am. Nat. 95: 137–145. Retrieved February 15, 2009. McVey, J.P., N.-H. Chao, and C.-S. Lee. 1993. CRC Handbook of Mariculture, Vol. 1: Crustacean Aquaculture. Boco Raton, FL: CRC Press. ISBN 0849302552. Monastersky, R. 1995. Iron versus the greenhouse. Science News September 30, 1995. Richtel, M. 2007. Recruiting plankton to fight global warming New York Times May 1, 2007. Retrieved February 15, 2009. Thurman, H.V. 1997. Introductory Oceanography. Prentice Hall College. ISBN 0132620723. This page was last modified on 17 February 2009, at 00:45.